This crush-proof, foldable hat is designed to keep up with on-the-go folks. It folds in half, and the brim compacts down in thirds, making it easy to stash in a pocket or purse. 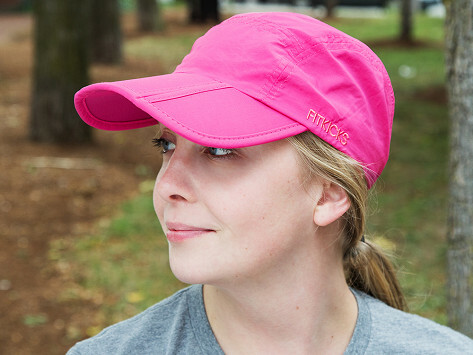 FitKicks' UPF 50+ sun protective material and extra-long brim add a bonus helping of sun-shielding, too. Dimensions: 7.25" x 3" x 1"
I love this hat, mostly because of the long bill on it. It's great and very good looking, fits nice. This is the most comfortable cap I've ever worn! It's flexible and lightweight yet sturdy and stays on snug. I love the fold-a-bility too. Like it! Look forward to being able to take it traveling and hiking! The hat folds in half, and the brim folds into thirds—so it’s easy to fit in a bag or even a pocket. We’re not surprised that the clever minds behind FitKicks’ super comfy, foldable shoes created another smartened-up take on an everyday wardrobe staple.